If you’ve already booked your wedding venue, hired a few important vendors, then it’s high time you started thinking about wedding invitations. They will set the tone for your big day while setting the expectations as well. Don’t let them send the wrong message! Here are some things you should keep in mind when picking the wedding invitations. The most important information wedding invitations should include are, of course, the location, date and time of the wedding reception. 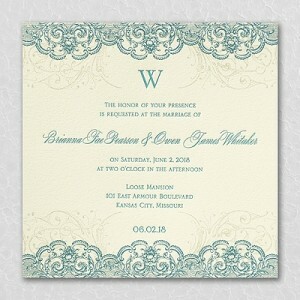 Nevertheless, the style of the wedding invitations hints to the formality of the event. too. So, if you’re throwing a modern, glam, casual or classic party, choose wedding invitations that hit the same note. Also, try to incorporate your wedding theme and colors into your wedding stationery, starting with the invitations. The traditional shape and size is always the right choice for wedding invitations. But, if you would like something more modern, unique and playful, don’t hesitate! It’s your big day and it has to reflect you and your personal style. Anyhow, it’s recommended not to be “too unique”; if you veer away from the standard envelope size, keep in mind that bulky or extra large invitations can significantly increase the postage. So, be creative but try to stick to the budget, too. 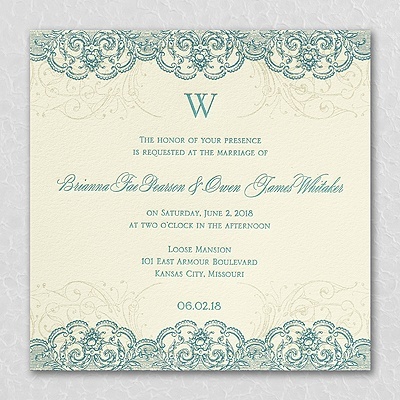 Another thing you should think about when choosing patterns, colors and font, is that your invitations are legible. After all, the whole point of sending the invitations is the information you put on them, therefore your invitees should be able to read and understand everything. The most common mistake many couples make when ordering wedding invitations is counting guests instead of households you’re actually inviting. One family should get one invitation, addressed to “The Powell Family”. For those couples who live apart, you can send out separate invitations or the one to the guests you are closer with, only make sure you include both names on the outer and inner envelopes. The cohabiting couples should get only one invitation, too.